Click below to view our Summer 2018 Visitor's Guide! 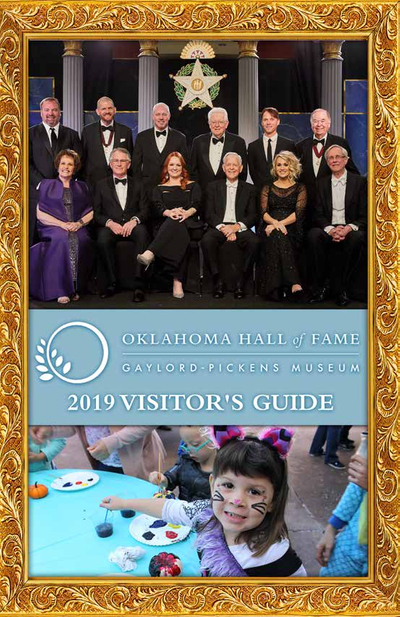 Welcome to the Gaylord-Pickens Museum, home of the Oklahoma Hall of Fame! We are located in Midtown, Oklahoma City. The Museum's interactive exhibits provide visitors the opportunity to experience Oklahoma's history through its people. Visitors meet both famous and everyday Oklahomans whose lives have impacted our state, country and world. The candid nature of the exhibitory allows visitors a unique look into the lives of Oklahomans like Reba McEntire, Wiley Post and Mat Hoffman. The faces, voices and spirit of Oklahoma from every walk of life that inhabit the Museum inspires our guests to change the world!. Our Museum is self-guided and staff are always available to answer questions and provide additional information during your tour. Reservations/appointments are not required. Should you have any questions prior to your visit, please contact our Museum Services Department at 405.235.4458. The Gaylord-Pickens Museum has fun, interactive events each month! Make a plan to visit with your friends and family. Free parking is available in the lot on the north side of the building. Buses and motorcoaches should drop passengers off at the entrance to the Edith Kinney Gaylord Garden and park on the north end of the parking lot. Click here for a map and detailed driving directions. Tuesday through Friday: 9 a.m. to 5 p.m. The Museum is closed on Independence Day, Thanksgiving Day, Christmas Eve, Christmas Day and New Year’s Day. Admission prices include sales tax. Special rates available for groups. Click here for more information. We accept the Oklahoma City Card! The Oklahoma Hall of Fame is one of more than 2,000 museums across America to offer free admission to military personnel and their families this summer in collaboration with the National Endowment for the Arts, Blue Star Families, and the Department of Defense. We offer FREE Admission every day during public operating hours from May 18, 2019 to September 2, 2019 for all members of the military and their families.